As the former Director of Corporate Synergy for The Walt Disney Company, Lorraine has established herself as a synergy strategist, innovative communicator, out-of-the-box marketer and writer with over two decades of experience. 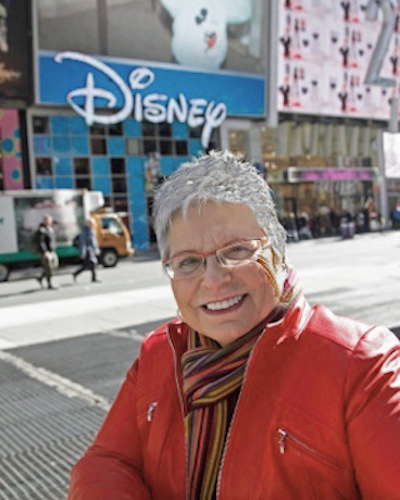 Lorraine launched her career with Disney as a motion picture and television publicist coordinating the public relations efforts of numerous Disney movies and television shows. After six years, she moved into the theme park arena and assumed the position of Manager of Publicity at Disneyland followed by a return to Disney Corporate headquarters where she was named Director of Corporate Synergy for the entire Walt Disney Company, a position she held for a decade. As the originating executive in that leadership role she coordinated all marketing communications and internal cross-promotions for over 50 diverse Disney businesses – from film and television to home video, consumer products, sports, theatrical productions and theme parks. After leaving Disney, in 2003 Lorraine launched Santoli Communications as a Marketing, Public Relations and Synergy consultancy bringing a vast scope of experience to her clients. She also speaks and lectures on synergy and how to make it work in a business environment. Additionally, for three years she served as the pro bono Executive Director of The Annette Funicello Research Fund for Neurological Diseases, an accredited 501(c)3 non-profit foundation. Most recently, Santoli has had her fourth book released. Entitled, “Inside the Disney Marketing Machine – in the Era of Michael Eisner and Frank Wells,” it details her Disney marketing experiences including the formation of the synergy program that was key to the company’s incredible growth and profit success during that period. The book is available at Amazon at: http://amzn.to/1IpJGMK. I grew up watching the reruns of the Mickey Mouse Club in the 1970s and, just like kids did in the 1950s, I became a big fan of Annette Funicello’s. I am familiar with your books on the MMC and I was wondering if I could ask you a question. I am just starting to work on a personal project. Simply put, as an Annette fan, I am trying to do something nice in her memory. If you would contact me, I will tell you more about it and what I have already done. I think you and everybody will like what I am trying to do. I hope to hear from you. Thank you.